Wikipedia is the largest and most popular general reference site on the web and anyone can contribute. But how do you get started? Here we take a look. One of the most popular websites in the world, Wikipedia, is always looking for new volunteer contributors. Best of all, becoming one isn’t a complicated process. In this article, you’ll learn how to become a Wikipedia contributor and what that means. In doing so, you’ll get a better idea of how Wikipedia works on a daily basis. Wikipedia is the largest and most popular general reference site on the web. Owned and operated by the non-profit Wikimedia Foundation, the site (and its many sub-sites) is available in over 300 languages through various platforms including a long list of mobile apps. Perhaps what has kept Wikipedia so popular for nearly 20 years of existence is its continued reliance on a community of volunteer contributors or so-called Wikipedians. According to Wikipedia Statistics, its properties were viewed 191.05 billion times between March 2018 and February 2019. Of those, the plurality of views came from the United States, which makes senses given Wikipedia has 5.8 million English pages versus the 1.51 million pages in No. 2 Spanish. As of March 2019, English Wikipedia had over 141,000 editors who have performed at least one edit in the last 30 days. These contributors range from expert scholars to casual Wikipedia readers. About half of these active editors spend at least one hour per day editing with one-fifth spending more than three hours per day doing the same. There are many reasons why you should consider becoming a registered Wikipedia contributor. Interestingly, many of these have little to do with actual editing or adding new pages to the site. Instead, having a registered Wikipedia account unlocks key reader benefits you might not have known existed. You don’t have to be a registered Wikipedia user to edit a page on the site. In this case, your IP address displays instead. Unregistered users can do almost everything a registered user can do, including editing articles, participating in talk page discussions, and contributing to site policy proposals. Unfortunately, if you’re unregistered and share the same outside IP (at a school or through an enterprise network, for example), you can become blocked depending on what other folks on your system are doing. If you do become a registered Wikipedia user, you’ll have a permanent user page where you can write something about yourself. You can also use this page to display pictures, write about your interests, and more. Registered users also have a permanent talk page (see below) that you can use to communicate with other users. Finally, a registered user is less identifiable since your IP address is not shown. When you are a registered Wikipedia user, you have a fixed identity that other users can recognize. In time, this can allow you to build trust and respect through a history of good edits. Wikipedia also rewards registered users for good work by handing out so-called Barnstars, Project Awards, Personal User Awards, and more. As your account ages successfully, you can earn further privileges such as rollback, sysop/administrator, and others. The rollback feature provides a button that you can use to undo the last edit to a given page and all previous edits by the same editor. As an administrator, you can block and unblock user accounts, IP addresses, and IP ranges from editing, plus edit fully protected pages, delete and undelete pages, rename pages without restriction, and use other tools. Registered Wikipedia users also can customize the way pages are displayed in their view. Under the Preferences tab (which shows up at the top right of Wikipedia pages for registered users, you can select Appearance and change skin, math, and files. Finally, being a registered user protects you in the event your enterprise IP address gets blocked. Registered users in good standing can request existing blocks on their IP address be modified to affect only unregistered editors so that they can continue contributing to Wikipedia. On the main Wikipedia page, click on Create Account at the top right of the screen. From here, you’ll need to fill out the form by adding your username, password (twice), and CAPTCHA Security check. Select “help me choose” if you’re having difficulties coming up with an appropriate and unused username. Once you’ve filled out the form, click the Create Your Account button. Once you create your account, you’re good to go and now a Wikipedia contributor! 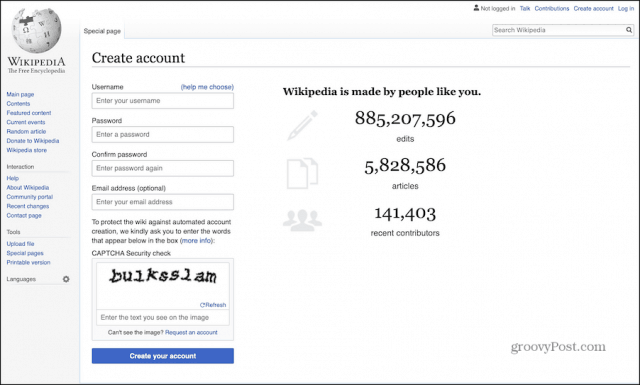 Now that you are a member of the Wikipedia team, start contributing to the pages on the service. Before doing so, you should take a look at the official Contributing to Wikipedia page. From this page, you can practice with tutorials, learn about the basics of editing, and more.